Posted on February 4, 2016 at 12:03 am. If you’re still feeling frazzled after the festive season, Roxy Palace have an array of offers sure to invigorate you thanks to their February Frenzy and two new pokie additions. The higher the loyalty tier, the better the rewards – as you can see above – so we recommend signing up and playing a bit before opting in for the bonus to take advantage of the best possible promotion. If you prefer smaller bonuses however, click our links, sign up, and opt in now by entering your username on the promotional page. You will then need to make the corresponding deposit to qualify, which is easy with the vast number of secure payment methods available. Players can opt in for a bonus every day, simply by making a deposit and can do so on their smartphone, tablet, laptop or desktop. It is important to note the bonus has a 50x wagering requirement attached, but fortunately the pokies are the best to clear it. Microgaming have designed two brand new pokies for February and they’re now available at Roxy Palace Casino. The first of the two pokies features five bikini clad girls playing a game of volleyball and dancing the day away at the beach – however it is animated so don’t get too excited. Featuring 5 reels and 243 ways to win, paylines are scrapped completely in this pokie, while there is a Free Spins feature to trigger, up to 15 initially with another 15 available to be re-trigged both featuring a 3x multiplier. There is also a unique Bonus round where players can opt to pay more in order to re-spin a selected reel in the aim to complete a winning payline. The cost varies depending on what combination you have on the reels. Earn your loyalty tier on Bikini Party via your desktop or mobile device at Roxy Palace casino. 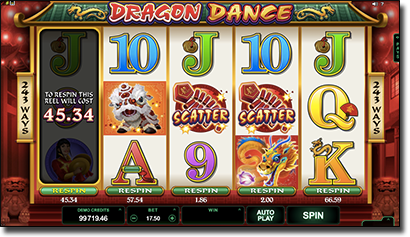 Dragon Dance is the second pokie to be released at Roxy Palace casino and while the themes are quite different, the format isn’t. Released just in time for the Chinese New Year, the pokie is based on the celebrations surrounding the event featuring dancing dragons, lion costumes, artists, drummers and more. The Free Spins feature, where players initially receive 15 free spins with a 3x multiplier (and 15 more are available to be re-triggered), as well as the Re-Spin Bonus where players can choose which reel to spin for an extra cost, are both available here. There are up to 60,000 coins available to be won on Dragon Dance, as there is on Bikini Party and you can play it on your smartphone, tablet, laptop or desktop. Sign up to Roxy Palace mobile and online casino via our links now if you aren’t a member yet to earn an extra bonus this month and trial the new February additions from Microgaming.